The fourth wall is nonexistent in our interactive mystery theatre experiences that keep audiences enthralled in suspense, yet thoroughly entertained. Mingle, dance and dine right alongside our eclectic array of characters while you gather clues. Featuring quality dining catered by local chefs, fine wine by local vintners, and festive music by local bands. 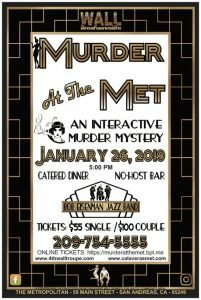 Enjoy the culture of Calaveras at Fourth Wall Entertainment Troupe’s quarterly murder mysteries at the beautiful, historic Metropolitan!